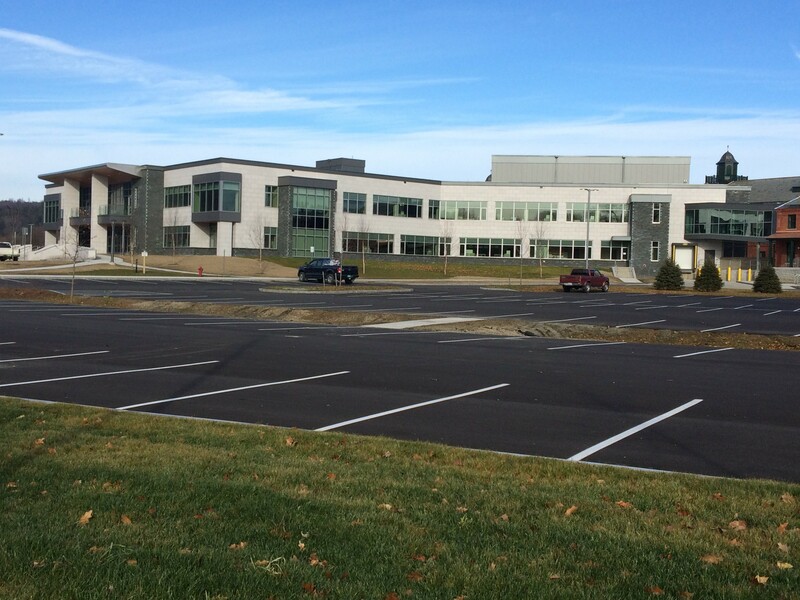 Four years after flooding from Tropical Storm Irene forced the state to tear down much of its Waterbury office complex, newly reconstructed offices are ready for occupancy. Gov. Peter Shumlin and Rep. Peter Welch (D-Vt) were among the officials who marked the re-opening Monday with a ribbon-cutting ceremony. The first employees—from the Department of Corrections—will report to work at the new structure next Monday. Floodwaters from the Winooski River, which runs behind the office complex, inundated dozens of buildings that once housed psychiatric patients. The entire complex began as the Vermont State Hospital, but as the patient census shrank, the space was renovated into offices for state workers. When Irene struck in 2011, 1,500 people worked at the complex. Fewer will return – about 830, all from the Agency of Human Services. The Agency of Natural Resources, which used to be housed at the complex, has been relocated permanently to Montpelier. A new psychiatric hospital was built in Berlin. The $130 million reconstruction project includes a new, 86,000-square-foot building and renovation of several connected historic structures that provide 120,000-square-feet of space. The new and renovated structures were built to be above the predicted 500-year-flood level. Project manager Mike Stevens said some work remains in the center and north ends of the historic buildings. Workers are scheduled to wrap up by January, Stevens said. After the first group of employees moves in next weekend, there will be a break from additional new arrivals for the holidays. Beginning January 9. Stevens said small groups would be moved every weekend until April 4, the target date for the building to be fully occupied. Snowstorms could push the date a little later, Stevens said. Funding for the project included $17 million from insurance, $31 million from the Federal Emergency Management Agency and $82 million in state funds.